Friday September 20th 1889 We washed and ironed some more today and I done a lot of work fixing lamps. Will and I started out at four oclcock and rode two hours looking for a girl but without success. I sewed in the evening. Saturday September 21st 1889 I was very busy with house work all forenoon. As soon as I ate my dinner. Will and I rode for two hours looking for a girl but did not get one. Hatt & Fanny with some company of hers was here all afternoon. Mother went to the bridge with them when they started home and met a little girl who she brought up here and I hired. Sunday September 22nd 1889 I was busy about the work all forenoon and read in the afternoon what time I had. Father and Mother went over to see how Eugene was and Will went and brought our little girl. I wrote in the evening to Joe Woolf. 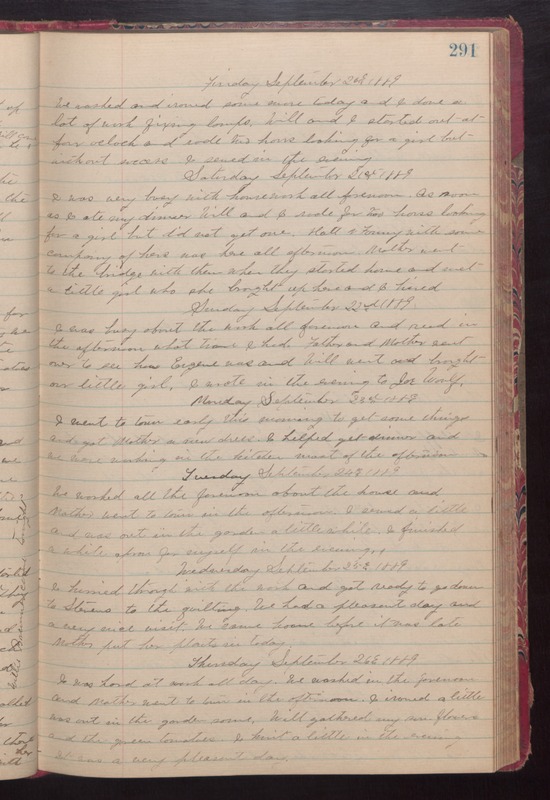 Monday September 23rd 1889 I went to town early this morning to get some things and got Mother a new dress. I helped get dinner and we were working in the kitchen most of the afternoon. Tuesday September 24th 1889 We worked all the forenoon about the house and Mother went to town in the afternoon. I sewed a little and was out in the garden a little while. I finished a white apron for myself in the evening. Wednesday September 25th 1889 I hurried through with the work and got ready to go down to Stevens to the quilting. We had a pleasant day and a very nice visit. We came home before it was late Mother put her [plants?] in today. Thursday September 26th 1889 I was hard at work all day. We washed in the forenoon and Mother went to town in the afternoon. I ironed a little was out in the garden some. Will gathered my some flowers and the green tomatoes. I knit a little in the evening. It was a very pleasant day.